You Beauty Box is a monthly subscription box where you get to choose what you get. They have recently changed and they now have different levels you can choose from. There is Bronze, Silver and Gold, where you either get to pick 2, 3 or 4 products. I haven’t tried any of the new levels since they introduced them so I am still on the bronze level. Prices for this box are £6.95, £8.95 and £10.95 per month and it is FREE P&P! I love the fact that I can get a little treat each month for only £6.95! It is such a bargain. You Beauty Box is created by You Magazine, which is a magazine that you get free with The Mail on Sunday (wow that’s a lot of you’s!). I have been getting this subscription box for quite a while now, definitely over a year. Some month’s are a lot better than others,but I continue to get it as it is just so cheap! 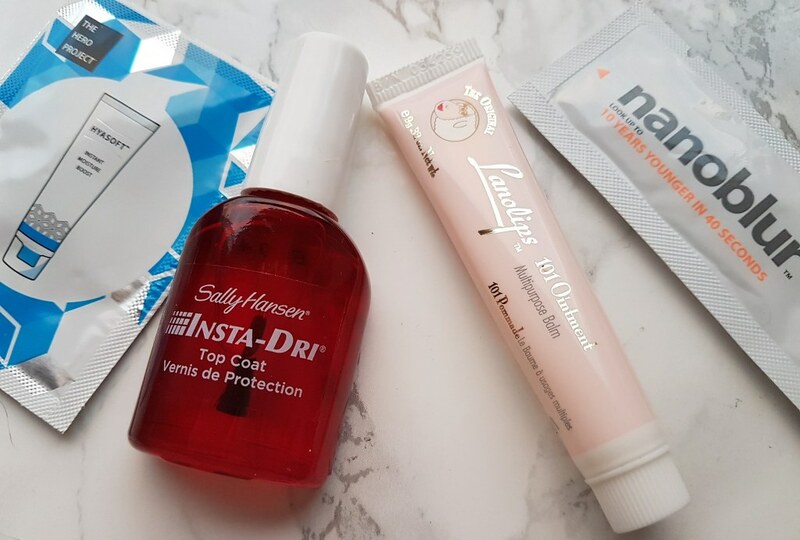 This month I picked the Sally Hansen Insta-Dri Top Coat and the Lanolips 101 Ointment. I wasn’t overly impressed with this month as what I did want (INIKA Liptint) wasn’t actually available as they had to take them off due to them not being up to standard or something. So this left me Umm’ing and Arrhh’ing trying to decide what to get instead! I went for the Sally Hansen Top Coat, as when I do decide to paint my nails (which is very rarely), I can never find a top coat. So I just thought maybe this might come in handy… for the couple of times a years I may actually wear nail varnish! As you can see this doesn’t really excite me that much, but I may put some nail varnish on just to try it out! This alone is worth £6.95 which is what I paid for the box, so you do get good value for money. The second item I went for was the Lanolips 101 Ointment. I went for this as I know I will get use out of it as I do use lipbalms and this is a multi-purpose one as you can use it on any dry spots and even your cuticles – apparently it has 101 uses! This is great to have handy in your bag and also to take on holiday with you as a little does go a long way. It is also suitable for vegetarians and babies. This item I wasn’t overly excited over but I knew that it would be useful so I popped it in my box. This is worth about £10.99 for a 15g tube, this one is a 9g tube, which makes it worth around £6.60. I also received a sachet of the Hyasoft Instant Moiture Boost (3ml) and Indeed Labs Nanoblur (2ml). There was also a packet of PROPERCORN lightly sea salted, I’m not a fan of salted popcorn but I will give them a try. Overall I wasn’t too excited by this month’s box, but you do always get value for your money. I chose items which I knew may be useful at times, so I will hopefully get use out of them. Next month I just hope there are items that I look forward to choosing! I will continue to get You Beauty Box as I can’t complain about the price, and well… I just love receiving packages in the post! Did you get this month’s You Beauty Box? If so what products did you choose? Yes it is such good value for money and so cheap! It really is a good affordable box to go for. The added extra of the propercorn was good as well, can’t complain getting popcorn! I will definitely try out the Sally Hansen. I do occasionally paint my nails, it just isn’t very often. Mine always chips so easily so it will be good to see how the sally hansen helps. It’s the first time I read about a subscription box where you can chose the items, it’s interesting. I have a top coat, but I rarely use it, even though I paint my nails often. They are good though. Thanks Anca. I do like how you can pick what items you want, it means you will get something that it more suitable for yourself.